Fine pair of Chinese Kangxi period vases with gilded decoration on cobalt blue ground in Louis XV ormolu mounts. Each baluster-form vase rests on a large base composed of scrolls and rocailles. The curved handles are in the form of acanthus scrolls embellished with bull rushes and terminating in bearded mascarons, probably river gods. They are connected to a reticulated ormolu rim. The vases are decorated with slightly rubbed gilded flowers and rockwork. The mounts are possibly German. 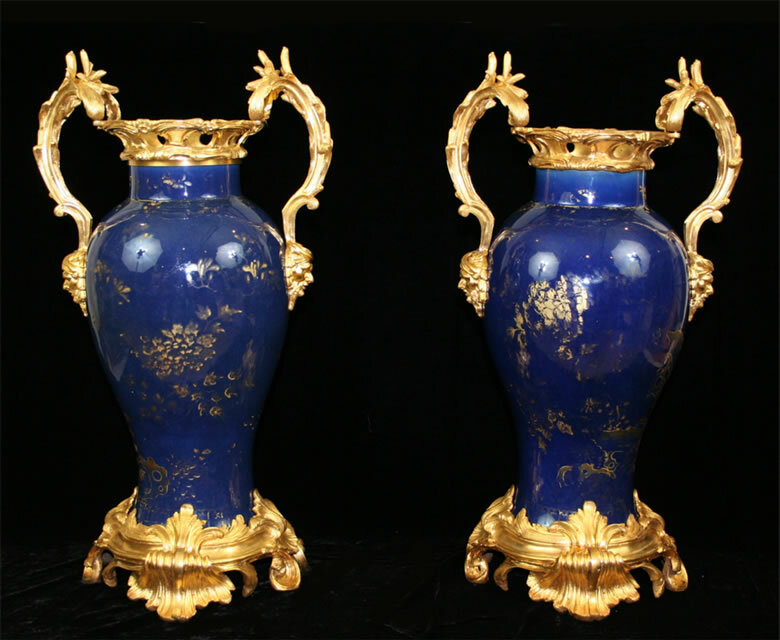 A pair of ormolu mounted Kangxi blue glazed vases in the Wildenstein sale (Christie’s, London: 15 December 2005; Lot310) share almost identical handles with the present vases.